In basic terms, dynamic insertion is where content is inserted in place of a token/variable – dynamically of course. 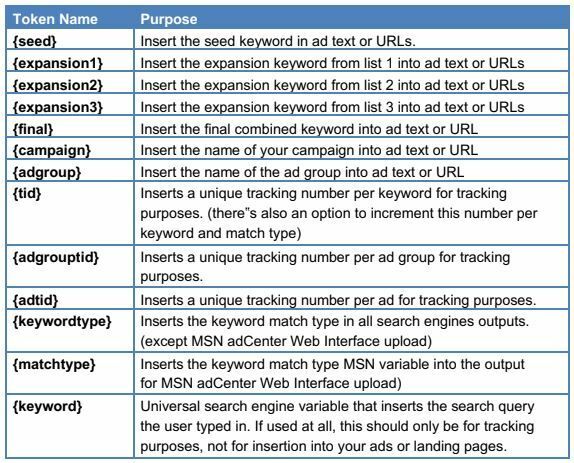 Dynamic insertion is not necessarily just used for keywords (as much as it&apos;s generally referred to as dynamic keyword insertion). You can use dynamic insertion to insert many types of values. It also doesn&apos;t need to be values that you only use in your ad text or landing page, they can also be tracking or identification variables. For example, you may want to insert your bid keyword into strategic places within your ad text and landing page content for relevancy throughout the entire process. However, you may want to use an tracking identification number on every keyword to help with your tracking, but you don&apos;t necessarily want this number appearing in your ad text! SpeedPPC has its own set of unique dynamic variables. This not only helps you create a chain of keyword relevancy throughout your entire campaign, it also gives you far greater control over what content is inserted into your ad creative. You can capitalise the text that the tokens insert, so it appears correctly in your ad text. This is controlled through capitalising (or not) the first letter of the token. For example, you may wish to use the capitalised version of the token in your headline, but the lower caps token in your ad text and/or URLs.